Businesses have been told time and again that they need to build their lists. But once you get those names, what do you do with them to turn them into lifelong customers? Using the right tools and tactics, such as segmenting your audience and maintaining constant contact with your leads and prospects, will ensure that your business sees a higher return on their email marketing as well as guarantee improvement in core business metrics. Dan Fagella started as a jiu jitsu champion and turned that into an extremely profitable online martial arts business. He now runs an email marketing agency, CLV Boost, where he teaches other business owners and aspiring entrepreneurs the power of targeted email marketing automation to help drive business metrics and boost their businesses to the next level. Lately small businesses are focusing most of their time on social media marketing but neglecting to cultivate their email list while not realizing that both tools working together have the most success. Is your email list too watered down and bloated? Have you been segmenting your audiences for a more targeted message? This week, we bring in Heather Jackson from Constant Contact to talk about the importance of a relevant email list and give us some great email marketing tips. Heather has made a career of helping entrepreneurs reach out to their target audience, and she’s here to share some of her secrets with you. How did you end up at Constant Contact? I ended up there thanks to an interesting path. I worked for Boston.com and Yahoo in the late 90s and early 2000s and appreciated the value of online marketing. I started two different businesses and I was a Constant Contact customer for each. I used their services and products. I became familiar with Corissa St. Laurent and I had a business that helped people out with email marketing and strategic consulting for digital marketing. I became an authorized local expert in New England. We could speak on their behalf and I got extra training and accreditation. I just loved every interaction with Constant Contact as a customer and as an authorized local expert and have enjoyed working with them the past few months. I talk to people like this all day in seminars and one-on-one. A large part of my job is educating small businesses about social media and email marketing. They are two tools in a tool box. Social media has a buzz, but the way you have a conversation with someone in email marketing is different. If you think about the nature of these tools; they have feeds and timelines scrolling down. It’s a little quicker and shorter conversation in social media. Think about the conversation you have with your neighbor on your street or in passing vs. one in which your neighbor invites you to dinner. Social media is the quick street conversation and email marketing is the conversation in the home. With email marketing people have given you permission to email them. Your message is going to live in their inbox. There’s a 99% chance they’re going to see your name and the subject line. Compared to Twitter or Facebook, which a 4-10% chance someone happens to be looking at your post in their feed at a given time. Both are really important. The most powerful relationship you have is when you have email marketing driving people to your social media sites and when you’re able to get more customers and visibility through social media through the types of content you post you can then get people to commit to joining your email list. It’s really important to have conversations with both platforms and users, but they are just tools in your digital marketing program. There are some great statistics. I saw a recent study that compared conversion rates for emails vs. social media. The email conversion rate was over 3%, search engine rate was 1.95% and 71.7% from social media conversion. You want to put your effort and call to action on all your platforms. I always ask people if they’ve checked their email. It’s important to use all those tactics to get to your target audience. What’s the value that a small business owner gets from sending out emails from an ESP (email service provider) rather than sending out emails from an inbox? There are a few important benefits. You have the ability to present a much more professional email, insert branding images and videos, make yourself look a lot better. There are so many spam filters with ISP inboxes, that when you send and bcc people from your inbox, it throws up a big red flag. With ESP you have at least a 95% chance the email will get through versus 75-80% chance with an ISP inbox. I’m talking about sending mass mailing. You want to make sure it gets through. On the backend, the ESP is going to provide you with awesome reporting – who received it, what people clicked on, what calls to action they responded to – and you can change and respond to what’s working or not. You want to put more of what works in future email campaigns. You have to have a one “click to unsubscribe” link. Any ESP platform is going to make this requirement much easier. They will also have more subscription options with an ESP. There are so many more tools with an ESP that makes sure the email looks professional, gets through, and then you have that inherent reporting and market research to see what’s working. Based on the tracking that the ESP offers, you can get insight into your customers’ preferences. What are some of the best practices for getting more subscribers through our websites or social media? Yes. It starts with lifestyle design and then we have to work on you. That’s a great question. I work with customers all the time that are putting off getting started until they have their email list perfect. You have to think about an email list as a constant work in progress. It continually has to be added to and cleaned up. It’s quality, not quantity. Your email list has to be relevant to what your message is and the content you send to them. You want to be adding to that list throughout the day. All of these tools are trying to drive people back to our website where the most robust content lives and all the relevant calls to action live. It’s really important to let people know what they’re going to get in exchange for giving their email address. There has to be something of value you you’re going to provide in exchange. You need to let people know what you’re going to do with it. You absolutely want to use your website, maybe use an app that makes a tab for promoting your email list to your followers. Have a “sign-up for my list” link in your email signature. Let people know when you’re face-to-face at events to meet people. You can mention your newsletter and ask for permission to add them to your email list. 57% of people will give an email if asked for it on the phone or in person. I think there’s a lot of different places to ask for permission and I recommend doing all of them. The incentive doesn’t have to be expensive. It could be additional tips or advice or special offers. I have a lot of customers that have some contacts in Outlook, written on paper, a stack of business cards, some are in QuickBooks, etc. My thought is, start with QuickBooks because you have implicit permission to send to them or start with you Outlook contacts. Just start with something and build it as you go. How do I go from that list of “QuickBooks contacts” and let them know I have an email newsletter if not, sending them an email? There are a couple different ways to address that. Then you can send them a confirmation email to verify they want to receive an email. That’s for people you’re currently doing business with. There’s an implicit permission there but it’s safer to ask for it. The people you’ve met along the way and contacts you’ve collected, if they get an unwanted email, it’s frustrating. They will remember that frustration. What I recommend you do with people like that is to send them a one-on-one email via your email. It’s time consuming, but do about 15 per day. Send them a greeting and a link to your newsletter with a link to your sign-up page or button. We’re trying to build our relationship, grow our engagement, get people to know us and trust us, to think of us as an expert and resource in our field. When people know and trust and like you, they’re going to buy from you and talk about you. All these platforms allow us to influence people with one email or tweet. What we’re trying to do with email and social media marketing together is to build a relationship and to get customers engaged so they say good things about you and refer you. If you have good content, they’re going to tell their friends about you. All I’m trying to do is help people use social media and email marketing to get their customers talk about them and say good things about them and refer them through email and social media. What are your thoughts on buying an email list? First, buying an email list and sending out a mass email is against the law, so I don’t recommend doing it! Second, you’ll alienate more people than you are likely to engage. Third, if you’re using a legitimate ESP, they’re likely to shut down your account due to a high rate of spam. Can you tell us a little about list segmentation and how we can put it to use for us? Absolutely. List segmentation is another great tool that an ESP is going to offer you. It lets you divide your customers up based on their interests or the role they play. Lets say you sign up for an email list for a company, and the first three emails you get are not related to that topic. You’re going to ask why you got those emails. Segmentation allows a business to send the most relevant content to the end user. If you’re getting relevant content, you’ll be much more willing to stay on that mailing list. It allows you to filter who’s getting what message. In Constant Contact you can create different lists or tag contacts with different things by relevant keyword. Then if I send out a newsletter, I can choose which list or tags are relevant and make sure that the email is relevant. I work with a lot of non-profits and they’ll have just a list for board members, a list of joined members, potential donors, fundraiser participants, so they’ll segment it appropriately. It’s a great way to use one tool to get people information only THEY want to know about. What are some of the best practices right NOW to get our emails delivered, opened, and read? Beginning with delivery, using an ESP like Constant Contact is going to help you get through those spam and junk filters. We haven’t seen our open rates go down a lot even with those new Gmail inbox tabs. Again, it comes back to the fact that it doesn’t do you any good to send emails out to people that don’t want to hear from you anyway. I’d rather have people unsubscribe and have a clean list than have a ton of people that aren’t getting any relevance and I’m not getting engagement. A couple tips for getting opened and read, the “from line” is very important. You need to be recognizable. You want to be sure the “from” is from you or your business – you want to make sure that’s identifiable. One big mistake is having your marketing person send that newsletter out and the email is coming from that marketing person and not you. They don’t know who they are. The subject line is the biggest key to getting your newsletter opened. I encourage people to go to the magazine section of their local store and check out those teasers on the cover pages of whatever industry magazines you read. See what they say to get you to open that magazine. Be specific and offer value in your subject line. You want to make sure that the content you’re putting in there is valuable to the end user. Often times what’s valuable to them is not always valuable in our eyes. You need to remember what is valuable to the end user – and that’s usually tips or how-to advice. Provide relevant information to your audience and you’ll get much better traction. They’ll be more likely to open your email next time too. Don’t be afraid to share your true expertise. Even if it seems second nature or obvious to you, it may not be so obvious to your audience. Giving true advice not only proves you know what you’re talking about, it builds trust in you as an expert. The more self-serving our content is, the worse it’s going to perform. What are some of the tactics we might be able to use to take advantage of a mobile email user? They key to mobile is to make it short, simple, and easily readable. Think about how you think on mobile devices and how you consume it. Everything is faster and in smaller pieces for us to digest and you can take that same approach to email marketing for mobile. 50% of people use their mobile to read their email. 23% of time spent on mobile is reading email. First, when you’re choosing a template, choose one that’s mobile friendly. Choose a single-column layout. You want to increase the size of your fonts to make it easier to read. For a headline, 22pt font, and for the body, 16pt font is where you want to be which is a step up from what a lot of us use in regular documents. I absolutely recommend using relevant images or videos. Everyone engages more with visual images or video. Don’t make them too big though. Send yourself a test first and open it up on your mobile phone to see if it’s easy to read. A lot of it speaks to understanding your customer audience and when and what they want to read. You can test this on the back end. What day and what time is the best to send an email? It varies by audience. We tested this with one client and it turned out that Fridays had much greater traction for them and one email at 4pm had much more engagement than 9am the same day. Testing and testing and revamping can help you find out what day and time is best to send. You want to maximize the time and return on your investment. Do you have any advice or best practices for getting your subscribers to take that next step down the proverbial sales funnel? I think you hit the nail on the head when you mention goals and objectives. It’s important to know what those goals and objectives are. Sometimes people may not be ready to take that next step now, but might be at a later point. What is your objective? Grow your business, make more money with less effort, or more donors, etc.? If you know this then you need to make it super easy for people to make this call to action that supports this objective. Many times businesses don’t even put their phone number in the email or how to get in touch with them! You want to make this important information prominent and visible both above the fold and below. You want to make it clear for people and have them contact you with the least amount of effort. It’s important to be super specific. If you want someone to “sign up and bring a friend” then you tell them that. If you know that goal and you have your specific objective, don’t be afraid to ask them to do something and then make it super easy to take action – call, email, visit, sign up, enter a contest, etc. Connect with Heather Jackson on Facebook. Follow Heather Jackson on Twitter. Check out the Constant Contact Learning Center. Check out Constant Contact’s blogs. There are plenty of benefits to creating knowledge based products…you can use them to establish your credibility, generate leads, and create additional streams of revenue for your business. In this episode of The Marketing Agents Podcast, I speak with online marketing expert Denise Wakeman about two of her specialties: creating a business blog that generates leads and how to turn everyday content into knowledge-based products that people will be willing to pay for. Whether you’ve been looking to build a powerful, lead-generating business blog, or create your first Kindle book, this episode has everything you need and more! Start with a blog. Too often businesses feel overwhelmed where to start with social media. Denise recommends a blog because it’s your home base, and unlike social media platforms, you own it. Determine your topics first. Topics become categories and you should have five posts ready to go in each category before you start. Use “social” to drive traffic and build your list. While you don’t own these channels, they are critical tools to drive traffic to your blog. 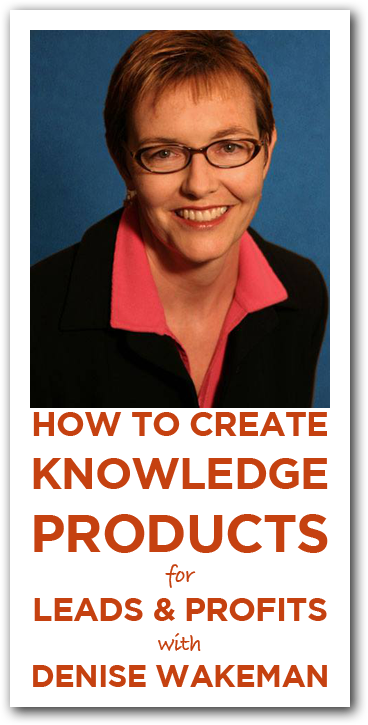 Create additional streams of income with knowledge-based products. Anything you’ve written or recorded can be turned into a product. Blog posts can be turned into a Kindle book. Interviews can become audio products. Transcripts of interviews can be turned into ebooks. Editorial Calendar (WordPress Plugin): Great for managing multiple authors, or just keeping track of upcoming posts for your own blog. Triberr: The network Denise uses to help promote blog posts and other topics. Denise Wakeman: Be sure to check out Denise’s home base and sign up for her newsletter!